I was reading when a notification popped up on my iPad. It read “Maya Angelou dead at 86”. I dropped everything in search of the article. I just couldn’t believe it. I still can’t believe it. Maya Angelou will be greatly missed. I heard someone say “My black feminist heart is weeping.” I couldn’t have said it better myself. Maya Angelou was a jack of all trades, but most of all inspiration for everyone. Her quotes give advice on love, liberation, freedom, women, men, education, and on many other dilemmas of life. She will live on through these quotes, her poems, and novels. I can say I was one of the lucky ones to have had the pleasure to see and hear this intelligent, wise beyond centuries woman speak in person. I remember how captivated the audience was when she spoke. The air was light and our spirits were lifted. The silence in the room was devoted to that special moment of sharing her poetry, her expression. I’ll never forget it. 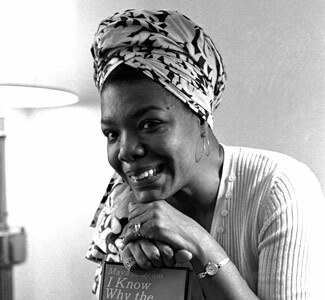 As a tribute to Maya Angelou writer, poet, educator, actor, director, producer, historian, activist, playwright, and…. Here are some ways you can celebrate National Poetry month. You could memorize a poem, host a poetry reading, start a poetry reading group, put some poetry in an unexpected place, read poetry to family and friends, put a poem in a letter, etc. We should all be honoring poetry and American poets. So here’s how I’m celebrating by publishing one of my favorite poems from Maya Angelou. Enjoy!